The Kansas City Royals came from behind to secure a 5-4 victory over the New York Mets in a dramatic opening game of the seven-match World Series. The Mets were set for a 4-3 win when, at the bottom of the ninth, Alex Gordon hit a home run to bring the Royals level and force extra innings. Eric Hosmer then hit long for Alcides Escobar to run in a 14th-inning winner. 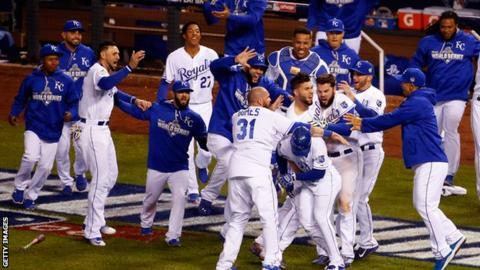 Played over five hours and nine minutes, the match was the longest ever World Series game one. It was also the joint longest ever World Series match by inning, tying with Boston's victory over Brooklyn in game two of the 1916 edition and the Chicago White Sox's triumph at Houston in game three in 2005. Game two will be played on Wednesday, again in Kansas City, before the series shifts to New York for game three on Friday. The Royals are appearing in their second consecutive Fall Classic, having lost out in the deciding seventh game to the San Francisco Giants last year. For the Mets, this is a first World Series appearance since 2000, when they lost to city rivals the New York Yankees.